Hang this metal wind sculpture from any eave or tree, and watch the gentle breeze bring multicolor motion and elegance into your garden or patio. Each of our metal wind spinners will twirl in your garden easily on the protected and encased high-quality ball bearing. Classic elegance and soothing motion even in high winds! 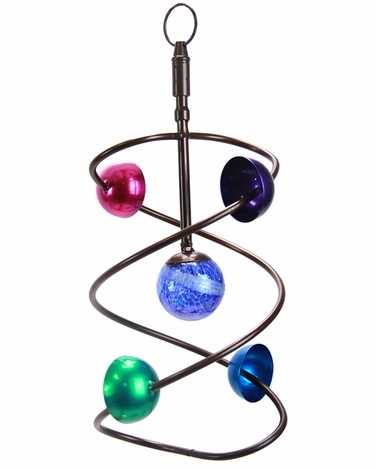 With a fancy wind spinning DNA double-helix design, this garden twirler brings a sense of wonder and illusion as the colorful wind cups send the decorative metal windspinner around a beautifully upgraded decorative glass ball design. Makes an extraordinary garden gift, and also a unique graduation gift for the doctor, biologist, chemist, and geneticist in your life! We've also been told that these kinetic sculptures make great astronomy gifts because they look like spinning solar systems. 15" Hanging Twirler Garden Spinner. Spins on a protected encased ball bearing.